Stainless steel case. Silicone band features an adjustable buckle closure. Round face. Three-hand analog display with quartz movement. Dial features luminous hands and hour markers, Victorinox detailing, a military time track, a minute track, and a date display window. Hour markers at bezel. Sapphire crystal with anti-reflective treatment. Water resistant 100m/330ft. Imported. 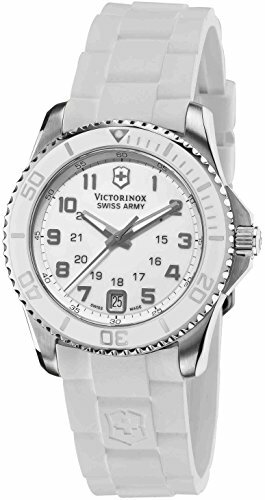 If you have any questions about this product by Victorinox Swiss Army, contact us by completing and submitting the form below. If you are looking for a specif part number, please include it with your message.